Fuji Tangle Free K Guides--Series KB KB guides are the tiny solution to one of the biggest problems plaguing micro layouts, and they offer the perfect transition from high-stress mid-rod sections to lower stress tip sections. 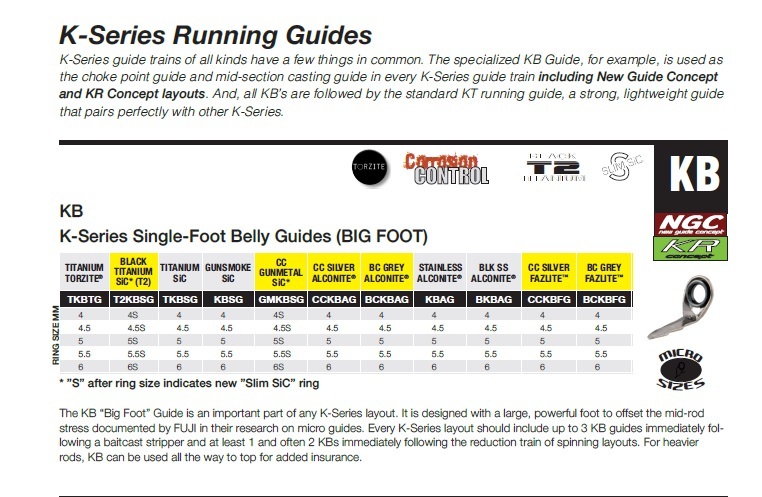 Fujis new KR Concept is a huge step in improving guide train efficiency, but the closer choke point outlined in the concept creates a need for additional mid-section running guides. These guides fall in areas where stress is very high under load. KB is designed to handle these stresses with a wider beveled foot that keeps guides securely in place and withstands loads far greater than the average fish fight. KB is offered in two micro sizes only and in most cases only 1 or 2 KBs are needed to provide enough strength for any micro layout.